Elderberry is a specialty crop that Andy Thomas has spent his career researching. Thomas, a research assistant professor in the Division of Plant Sciences, has worked at the Southwest Research Center since 1996. He has studied elderberries since 1997. Elderberry is a common shrub, native to Missouri and much of eastern North America. Both its fruit and flowers have been used for centuries in various food and medicinal products. As a crop, elderberry is well established in Europe and rapidly gaining momentum in the U.S. and Canada. The Southwest Research Center is well-known for its specialty crop production. Thomas grows pecans, … Expand ▸The Southwest Research Center is well-known for its specialty crop production. Thomas grows pecans, hickory nuts, chestnuts, persimmons and a variety of other plants, including elderberry. It’s also a specialty crop that Andy Thomas has spent his career researching. Thomas, a research assistant professor in the Division of Plant Sciences, has worked at the Southwest Research Center since 1996. He has studied elderberries since 1997. 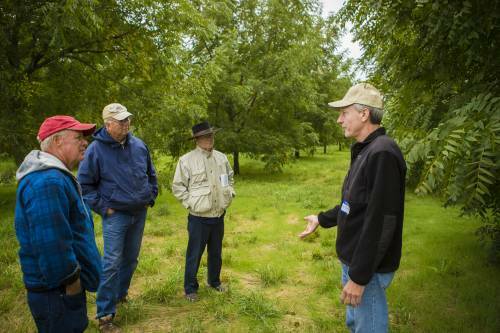 Thomas’ interest in the crop began during a regional fruit meeting in Kansas, which featured researchers from across the globe. Wine was served during one part of the meeting. Thomas liked the taste and wondered what grape was used in its development. Thomas soon learned that it was actually elderberry wine. The Southwest Research Center is well-known for its specialty crop production. Thomas grows pecans, hickory nuts, chestnuts, persimmons and a variety of other plants, including elderberry. Thomas said the market for elderberries has continued to grow. Missouri features 2,000 acres of elderberries and the Center features 50 or so cultivars of the fruit. Elderberries are considered a processing crop, not a you-pick crop like blueberries or blackberries. Elderberries don’t taste great right off of the plant. While the elderberry fruit is most commonly consumed in the U.S. in wines or as a dietary supplement, in Europe, the flower is consumed for its anti-viral properties, and in energy drinks. The fruit is also used as a natural food coloring in high-end syrups and other products. It can make an appearance in cookies, too. Elderberries contain a good amount of iron, potassium and vitamins A, B and C. It also has antioxidants known as anthocyanins. Thomas has two massive elderberry research projects in the works. The first is focused on flower and fruit production and harvest. The second project is centered on how the environment and genetics affect elderberries grown across the country. Thomas has six cultivars in the first project, which is funded by the Missouri Department of Agriculture. The cultivars are split into plots with different objectives. All of the flowers in some plots are harvested. Other plots have no flowers being harvested. And others have either 50 or 25 percent of the flowers harvested. The goal of the project is to understand and document potential elderflower production, and to see how the different harvesting techniques affect the fruit and flower quality. The second project is in partnership with the Missouri Botanical Garden. A group collected elderberry cultivars across the eastern United States, using a GPS to track where each wild elderberry was found. 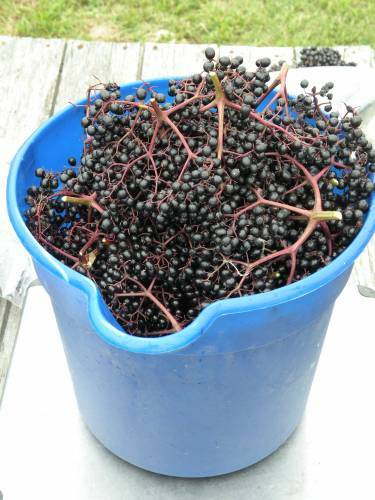 The elderberries were then sent to the British Columbia Institute of Technology for an antioxidant analysis. The results showed different levels and profiles of the antioxidants. Thomas has planted 20 of the selections side by side in replicated plots. All of the elderberry cultivars are facing the same environmental factors under Thomas’ watch. While the elderberry fruit is most commonly consumed in the U.S. in wines or as a dietary … Expand ▸While the elderberry fruit is most commonly consumed in the U.S. in wines or as a dietary supplement, in Europe, the flower is consumed for its anti-viral properties, and in energy drinks. The fruit is also used as a natural food coloring in high-end syrups and other products. It can make an appearance in cookies, too. The selection of cultivars for the second project was not made for horticulture reasons; however, Thomas said the collection has become extremely valuable as a source of diverse genetic material, some of which may form the foundation of a future elderberry breeding program. 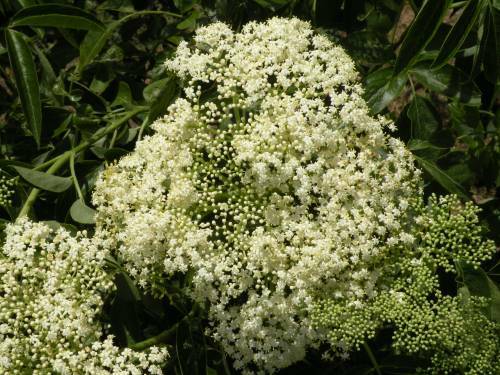 Elderberries flower in June and are harvested in late July and most of August. As with any crop, there are a handful of diseases and insect pests to pay attention to, but, overall, elderberry is an easy-to-grow crop. Elderberries do like water, as long as it’s not standing water. Thomas continues to present on his elderberry research. He has traveled overseas to talk to other elderberry researchers about the Research Center’s findings.